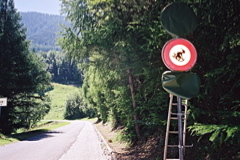 The most common climb up to Col du Lein (a pass with many name variations) starts in Saxon (465m). There are some alternative roads to choose on either side up the pass and I have tried to indicate them in the map. The main road from Saxon is quite a nice road that takes you up evenly in serpentines through plantations of apricots. It is not an easy climb but it is seldom very steep. With 1221m height metres to conquer you will get tired before you get up. The end of the climb is rather uneventful as you enter the woods and soon thereafter the road turns to gravel for 730m to the top of the pass. This last section of gravel is a bit longer than I usually admit in the list, but even most road cyclists think of it as beeing asphalted as the gravel part is so easy and the road is flatter here. You can start the climb a bit further toward Martigny just before leaving Saxon on a sweet little alternative road. There is also a shorter and probably very steep alternative from Saxon centre (see the light blue line). Further up there is also a road choice, but the alternative road is merely 100m shorter, so they should be somewhat comparable in difficulty. You can also start in Sembrancher (713m) if coming down from the Col du Grand St-Bernard/Colle del Gran San Bernardo (2469m). If you have been visiting Col de la Croix de Cœur/Col des Établons (2174m) above Verbier, you start at the turn-off for Vollèges (827m). I always give the shortest asphalted climbs possible, but you could take the bigger main road. There is only a short stretch (740m to the high point and 450m to the first pass) that is gravel on this side too from the last bend at 1625m. I did descend via Col du Tronc (1608m) and Col des Planches (1408m), where there is a smooth asphalt road down to Sembrancher, but it does not make much sense climbing this road to Col du Lein, unless you want to collect passes. Finally you can climb the road from Martigny via these two extra passes, which make a bit more sense than visiting those passes via Sembrancher as it is the only alternative road from Martigny. This should also be a hard climb and partly because the longer gravel section that might not always be very good up here. Other comments It makes for a great loop taking in the Col de la Croix de Cœur, by starting in Saxon and going over Col du Lein and then up from Verbier. There are more possibilities, like climbing the nearby Col de Champex (1497m). The walking pass and the pass from Vollèges to Col du Tronc are both 1658m.